Software studio Scirra has used the dual weapons of nostalgia + so-crap-it’s-good to try to convince people to buy its Construct 2 games development platform. The Microsoft Paint billboard has appeared in South London and demonstrates that it’s not always cutting-edge design that gets you noticed. With such prominent billing, the team probably had to shave costs somewhere, so using a free computer program like Paint and your own free-hand drawing skills wasn’t a bid choice. The artist Tom Gullen, also cofounder of Scirra, said the design took him just 15 minutes to do. 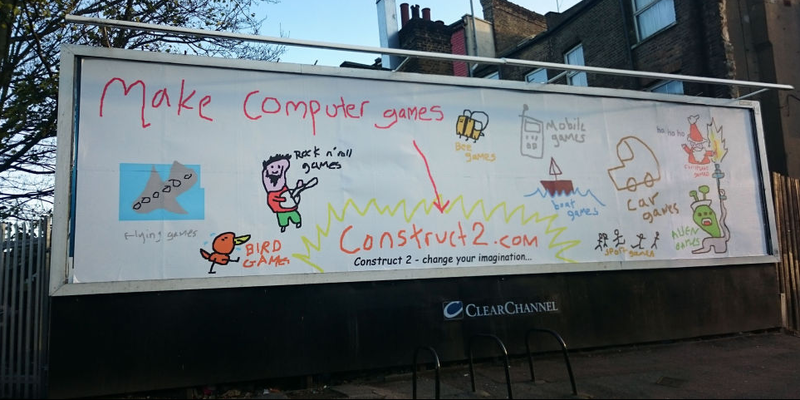 Construct 2 is a ‘programming-free’ games development platform that costs £80, so creating a design-skills-free ad campaign is really rather fitting. Microsoft Paint was first launched back in 1985 as part of Windows 1.0 and it’s a program we all love to hate. But actually, there are some pretty good Paint artists out there too.